Summary: Frances (age 9) and Elsie (age 15) are two young girls who are seemingly bored in their small England town during World War I. They decide one day to create fairies by drawing, coloring, and cutting out the small figures. They then set them in woods behind their house and took pictures with them to make it appear as though the fairies were real. Because technology at the time did not include photo editing and the photos were not as clear as they would be today, people believed they were real. The trick went so far as to fool the likes of Sir Arthur Conan Doyle, renowned Sherlock Holmes creator. My Review: I thought the book was quick and enjoyable. I had heard of these fairy photographs but did not know anything substantial about the story. The author tries to get into the mindset of the children and why they did what they did. The book is very much a narrative nonfiction work, to the point where I wanted to question the details. Losure cited that much of the material came from Frances's own book, which made it more reliable. However, I am not sure how reliable she is because the book represents her as slightly neurotic and it is unclear whether she believed there really were fairies. 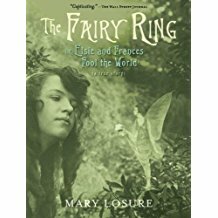 All in all, I would recommend it to children who are interested in fairies and fantasies with a note to read more about the history of it. Wild Boy: The Real Life of the Savage of Aveyron- Mary Losure (For those that like the writing style of Ms. Losure comes this book about another little known bit of history. (A note to Melissa and Dr. Lamb)-- This is Ally Watkins. Apparently, Blogspot will insist on using my personal Google profile as I comment, which is listed under my first and middle name. Melissa, I'm glad to hear you enjoyed this book! I thought it looked rather interesting when we had to look at a preview of it for a past LitBit, but I haven't gotten to check it out yet! I completely understand questioning some of the details in a work of narrative nonfiction. The stories are so much more enjoyable to me that way, but sometimes the details can be fuzzy! I'd like to read this and see if I can track down some of the author's sources to see where she got her ideas.